Today’s adventure is Panning for Gold at the site of the First US Gold Rush, Dahlonega Georgia! Gold was first discovered near Dahlonega, Georgia in 1828. 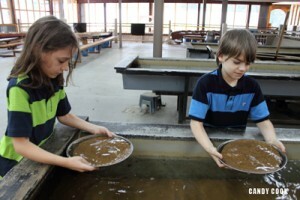 Although gold became much more difficult to find in the 1840s, you can still find folks panning the rivers of North Georgia on a regular basis. We visited Consolidated Gold Mines, in 2012, to learn a little more about this significant event in our local area & national history. Unfortunately, we didn’t find enough gold to pay for our visit. But, we had a fun time trying. Our visit included an informational & instructional video on gold mining & panning, expert assistance and a very interesting tour through one of the most profitable gold mines of the time, Consolidated Gold Mines. Watch our video and plan your visit. We keep saying we want to go look for gold and haven’t done it….we soooo need to. I’m sure my kiddos would love it!